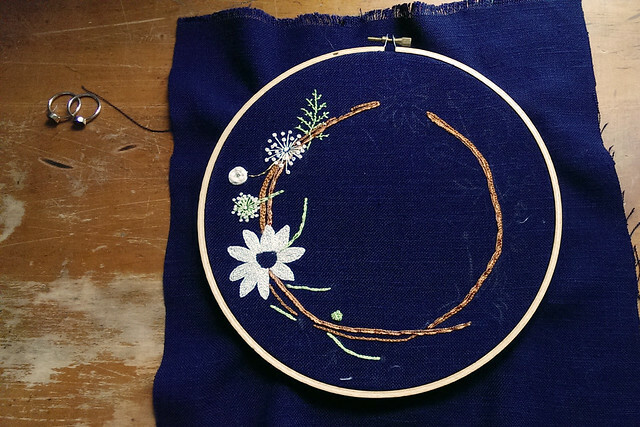 Well, I finally posted the results of my "secret" embroidery project. 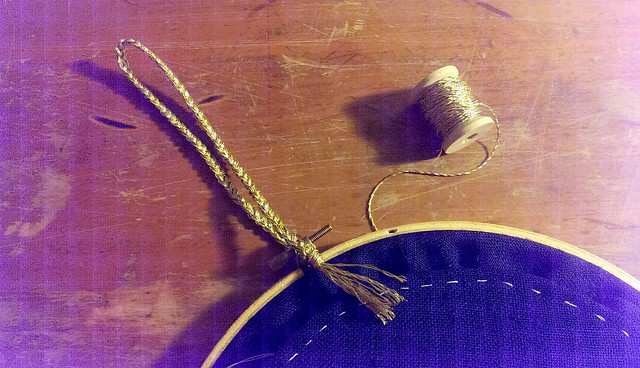 Stitching on the mesh was a wonderful experience, but it did have its challenges, all of which I go into in my post. My favorite part was probably the sheen of it - it makes everything look like it's glowing - and layering fabric underneath creates an added "floating" effect. 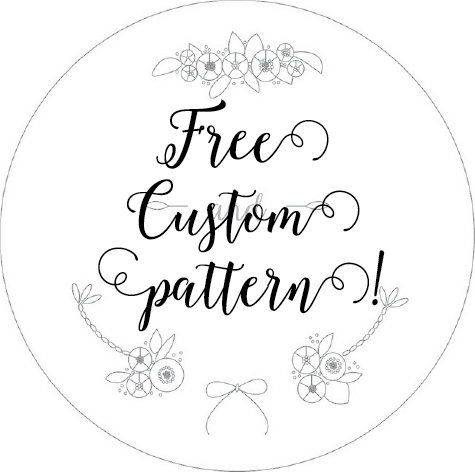 I'm doing a very special giveaway on Feeling Stitchy - if you like the pattern I used for the embroidery, I'll create a custom pattern, with the names of your choices, for two winners! 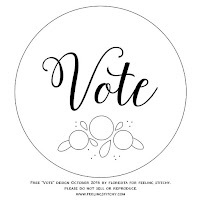 I haven't gotten a lot of entries so far, but I'm still very excited to create a pattern for the people who have responded. Please add your name to the comments, if you're interested! 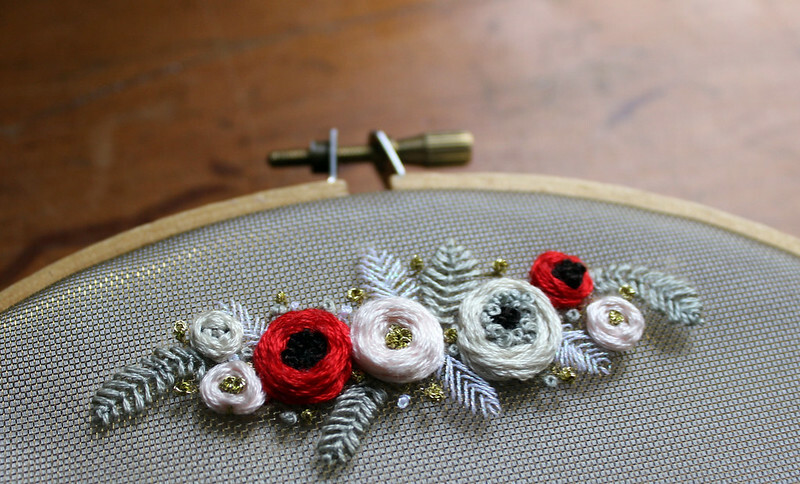 Here's a preview of the pattern I'm featuring tomorrow on Feeling Stitchy for Wonderful Wednesday - this lovely free pattern was tweeted to us last week by Modern Folk Embroidery, and to me, it speaks volumes. I'm going to be totally honest - these past few weeks have been hard. Every day, I find myself re-assessing where I am, and how I am to respond. The acts of hate I have seen out there don't belong in the country I love, and yet, they're there. There is division in families, friendships, workplaces and churches. I find myself asking each day "what can I do?" What can I do to stem the tide of hate, what can I do to protect the people in this country who are afraid, who are being attacked, and who are vulnerable? It's taken some time, but here's my answer: every day, however I can, I'm going to do what I can do. 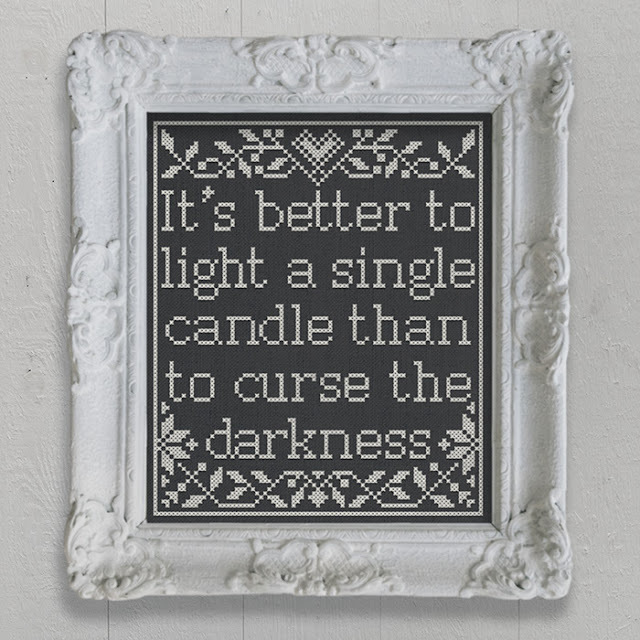 These are all small things, the mere lighting of a candle, but each time I can, I will do what I can. Where my budget will not allow, I'll do my best to help with my hands and my feet. But above all, when I see people being threatened, or who are being hurt or are afraid, I will stand up for them, however I can. As my favorite prayer says, I will do all of this "with God's help." 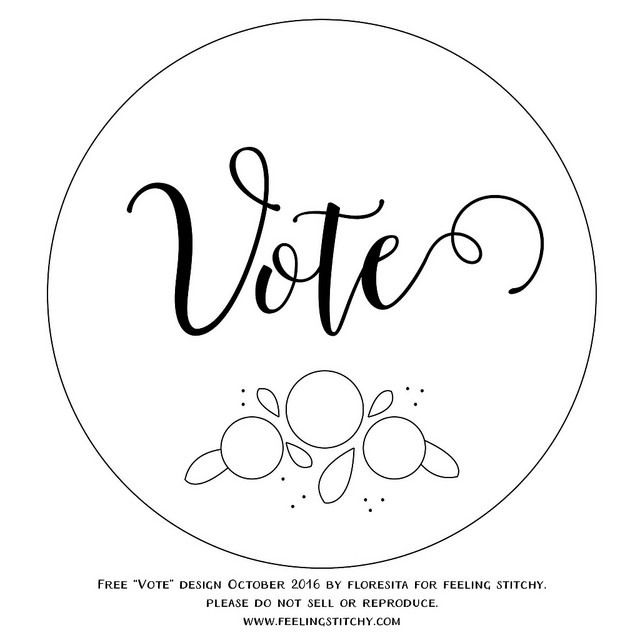 I had so much fun stitching up this free Vote pattern for Feeling Stitchy. It all started with Twitterfeed shutting down as of today, and me wondering how people find the blog the most. 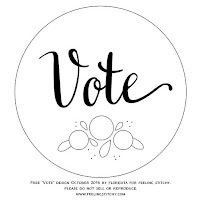 So I crunched as many numbers as possible, but also thought it would be fun to let everyone "vote" from the particular place they were seeing the blog - Twitter, Blogger, Facebook, and Instagram. 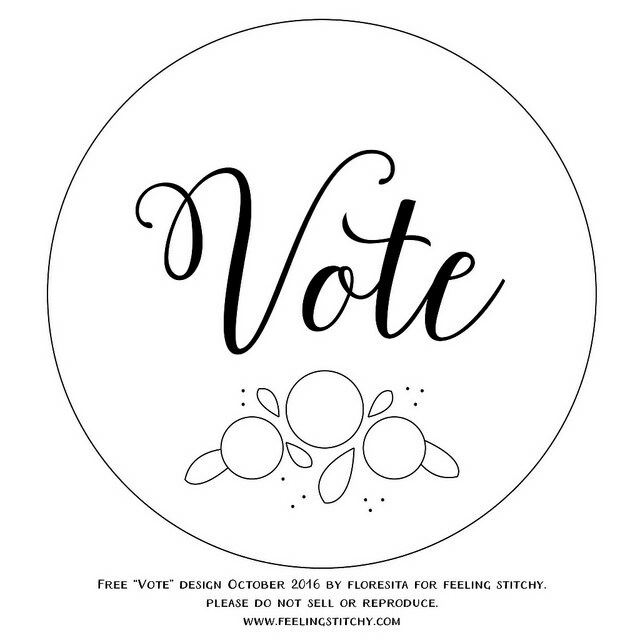 I had 3 designs, that were all only different in terms of the fonts I used, and allowed peeps to vote. Boy, was Twitter quiet - I decided we haven't been using it as well as we could, by simply auto-posting. I'll try to be more diligent about visiting at least once a week with a more substantial presence. Facebook was also rather quiet - it could have just been the time of day. 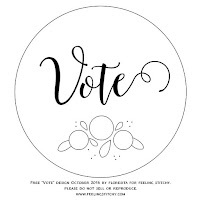 Instagram had the most votes. Honestly, I didn't even try Flickr, because it has been very quiet lately. 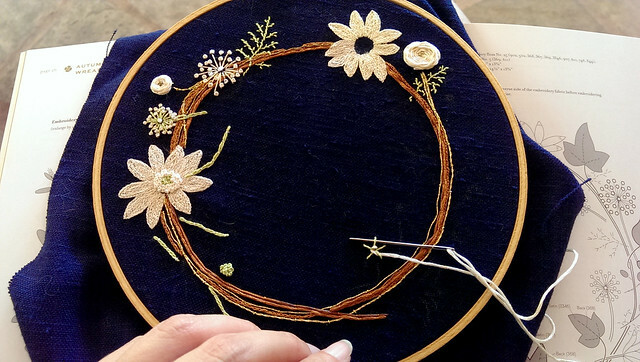 Stitching made me a bit nervous, as I wanted to finish on Saturday - so I woke up bright and early and lined up some coffee to get stitching the winning design. I could have added a whole lot more, but I wanted to stay true to the way I originally drew the design. I guess it was a lesson in designing, too! 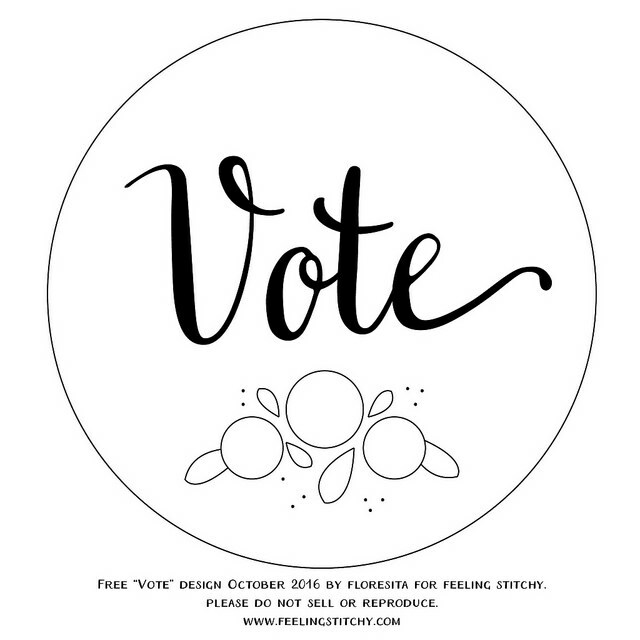 Let's face it, this voting season in the U.S. has been anything but fun. 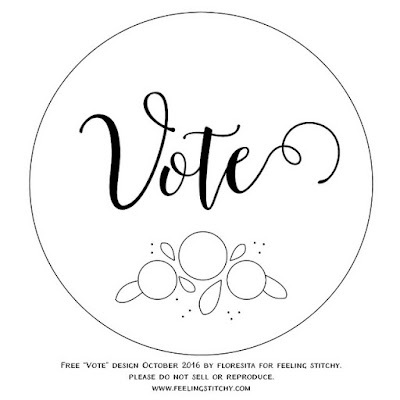 So I'm doing a fun vote project over on Feeling Stitchy. 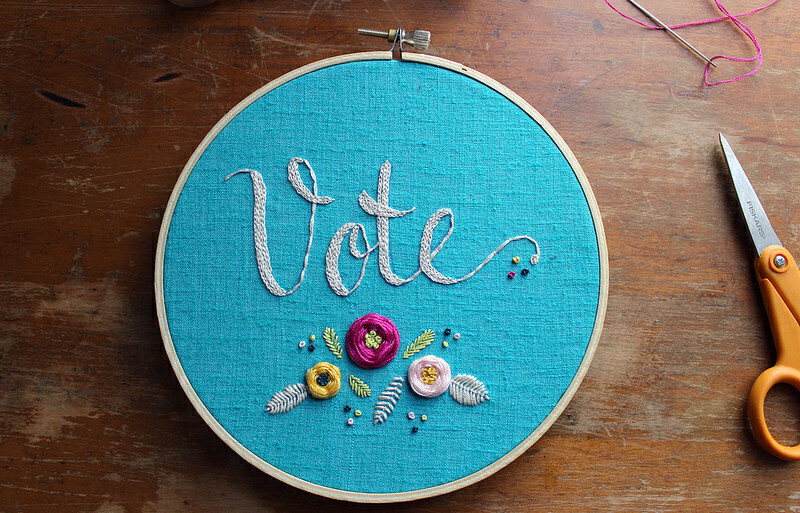 Vote for your favorite design, and I'll stitch it up and offer it as a free pattern on the blog this weekend. Which should give you all plenty of time to stitch up a little something in time for election day. :) What do you think? 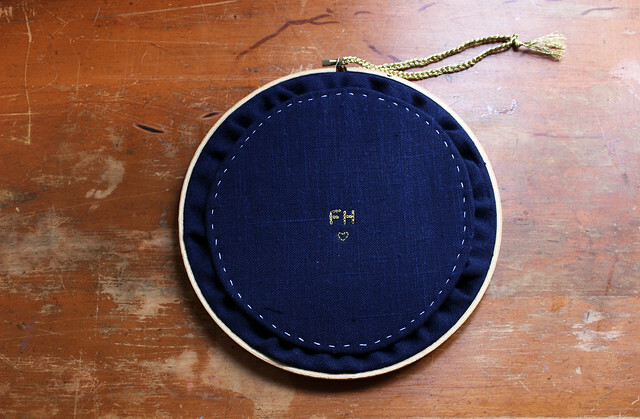 I'm calling it a secret project because I don't want to reveal too many details in case the receiver of this gift reads this blog! 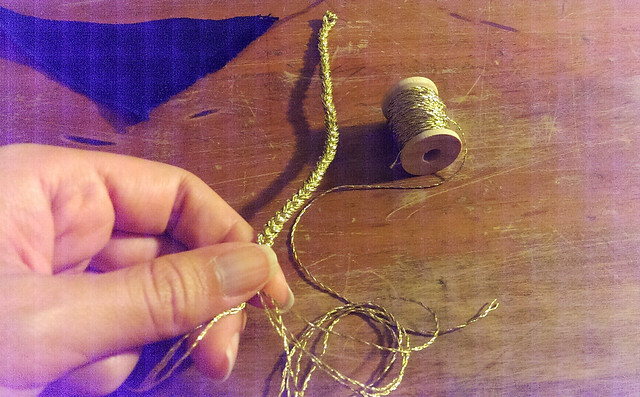 :) I'm working on a beautiful DMC gold mesh for the first time ever (which I received from the lovely people at DMC). 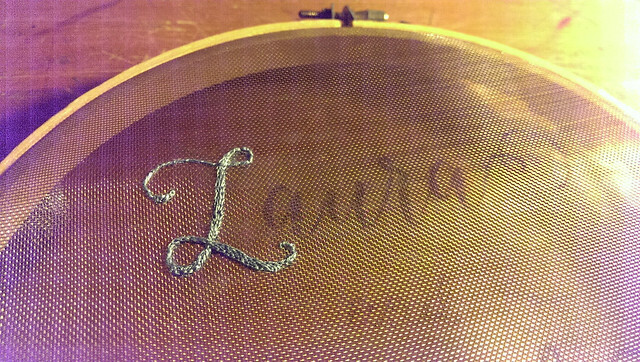 It has been a bit of a challenge to stitch on, but remarkably well-suited to stitches like couching and split stitch, with which I worked that nice "L". Mostly, this transparent surface has taught me the value of keeping the back of my work nice and neat (something I'll admit I've never fussed about before). 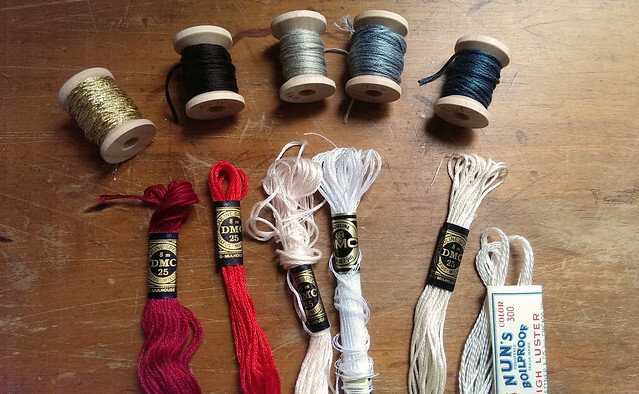 Once again, I have found Mary Corbet's Needle n' Thread posts invaluable in learning tips and tricks. 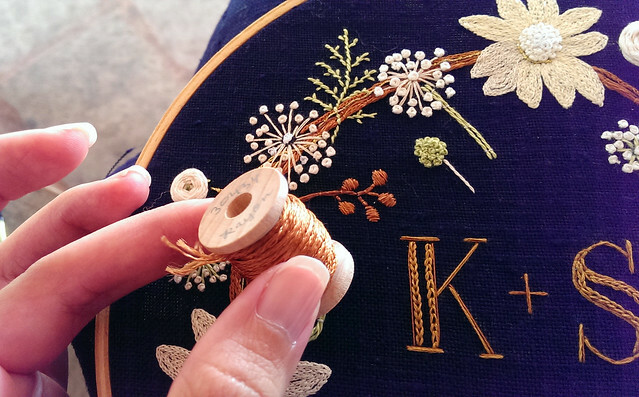 This post on lettering in particular helped me moved away from messy knots on the back of my work. After many hours of stitching and imagining and re-tracing, I am done! 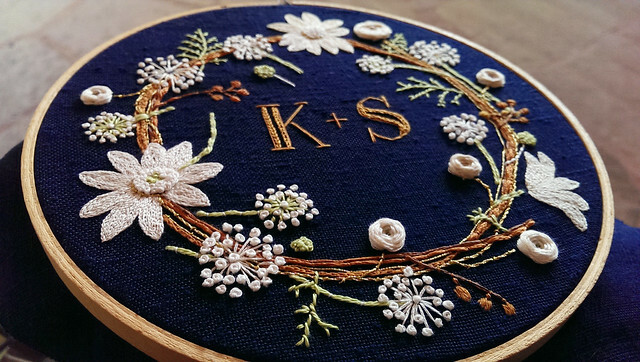 This project was one of the most fun I've ever attempted - I think part of it was all the encouragement I received on Instagram that kept me plugging along week after week. I finished the back as neatly as possible, but I purposely made the stitches a bit long and loose, in case the back ever needs to be removed for repair or to re-stretch the embroidery. 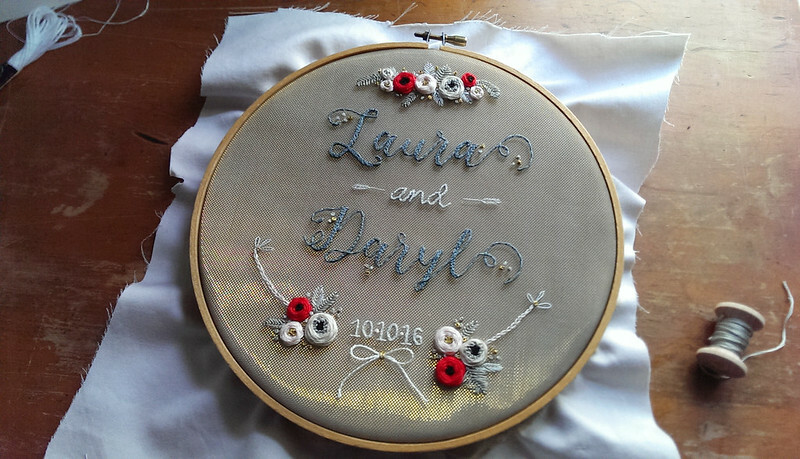 I won't lie, I struggled a bit with the tiny date - I re-stitched it countless times, but I like this simple, very small, un-fussy version. 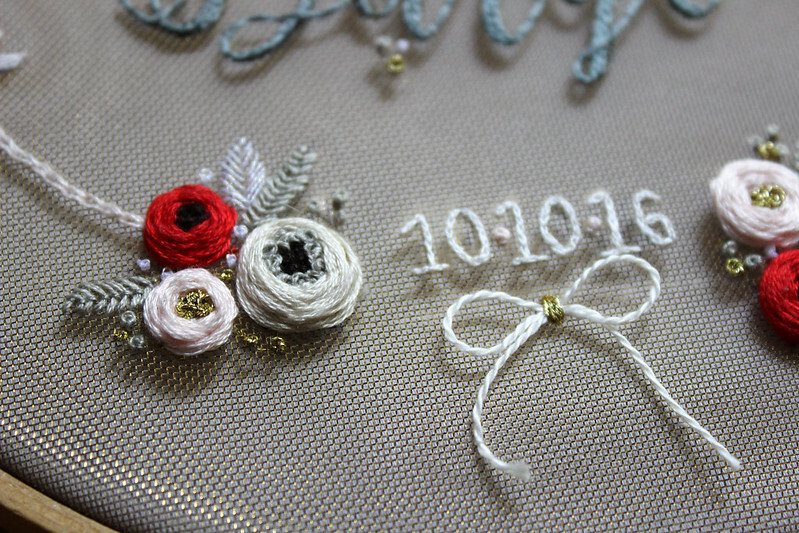 I used DMC gold thread, just one strand for the date. I'm almost finished and I have to say I am really happy with this project. 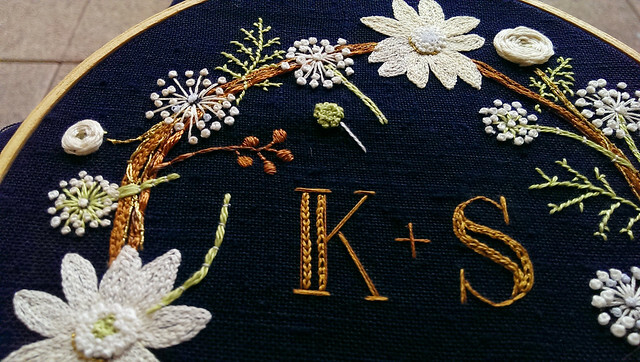 Up above, you see my progress with adding initials in the center. 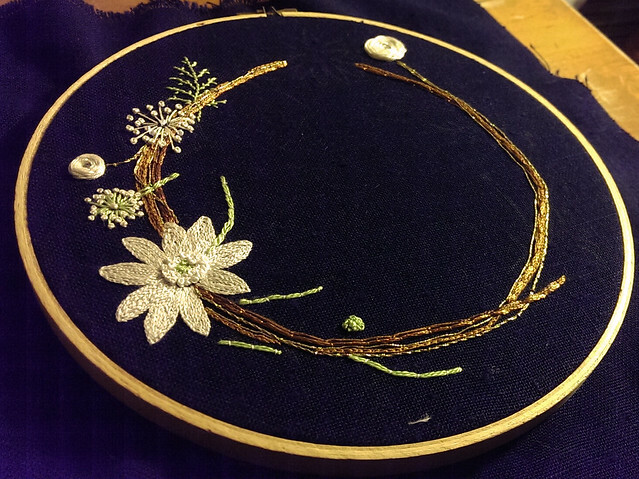 I stitched the berries using 1 strand of DMC rayon floss in a shiny copper color - 30434 - Sepia Brown. The finished berries - I love the sheen. Here's what I hope the finished back will look like - nice and neat! Apologies for the last few photos, they were taken in the middle of some late-night crafting, and my cell camera is very odd in low light. But there's my progress so far! 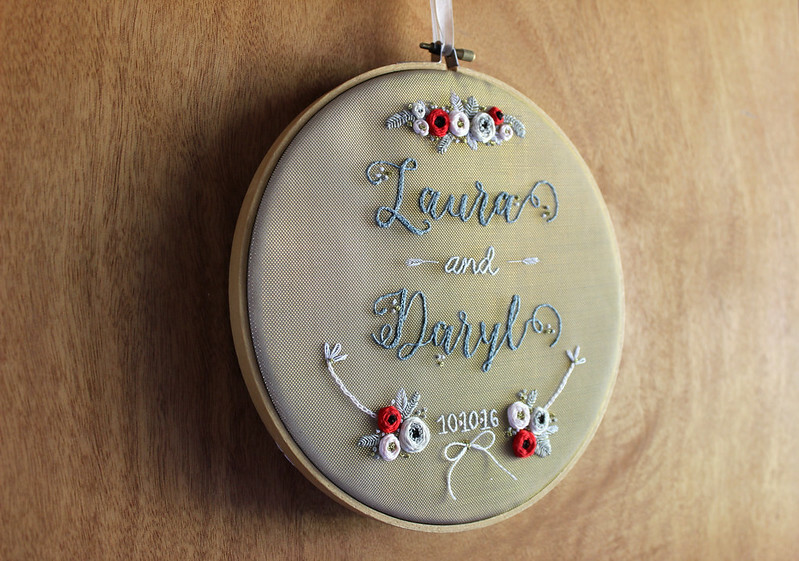 I'll get some proper photos before I give the hoop away, and share those and a book review on Feeling Stitchy very soon! 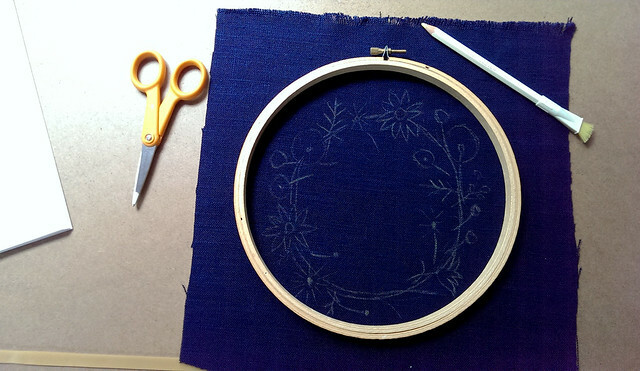 After all the chalk marks on my navy blue linen faded, I decided to try stitching on tracing paper. Looks like I make things bigger when eyeballing the pattern... I didn't stress, because I'm not aiming for an exact reproduction. 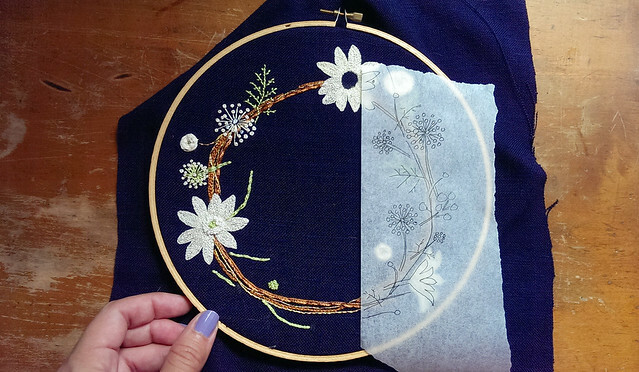 I stitched over the tracing paper on a big french knot dandelion - I was inspired by this great tutorial by Mary Corbet on Needle n Thread. 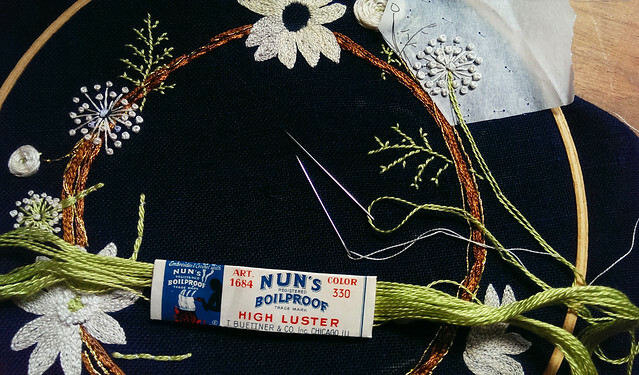 By the way, I'm really enjoying stitching with that Nun's Boilproof vintage floss. 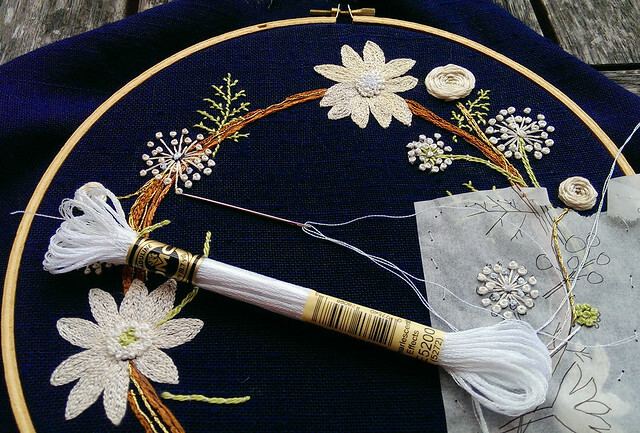 Next I couched the dandelion stems, using more Nun's Boilproof vintage floss. 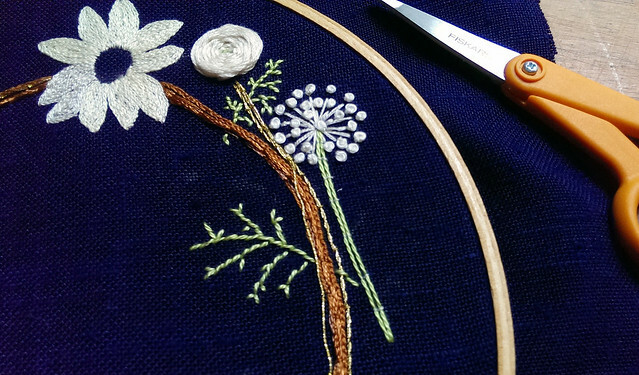 Here's the finished Dandelion - the tracing paper did help me stitch those knots more carefully. 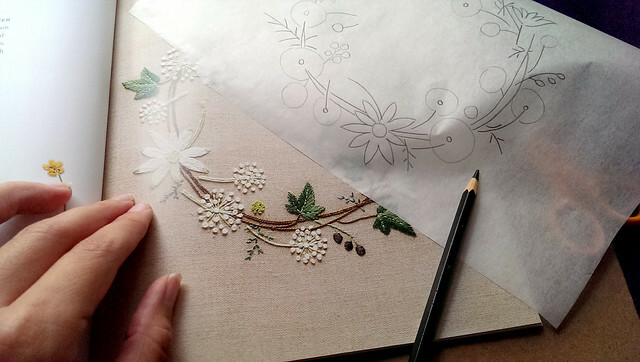 The only drawback was of course, when I removed the tracing paper, several knots were pulled. 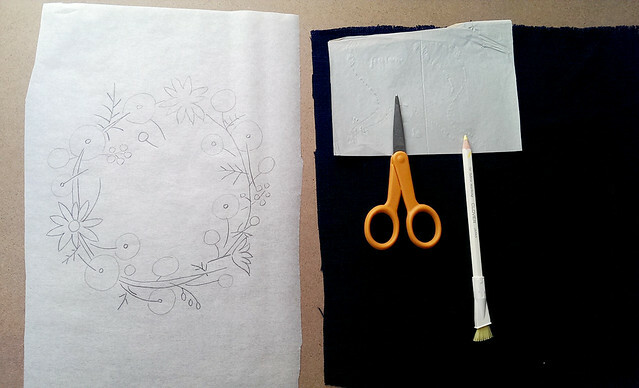 I think I'll do a combination of tracing paper and just eyeballing for the rest of the dandelions. Here's all my progress so far - I'm still deciding if I'll add the berries. 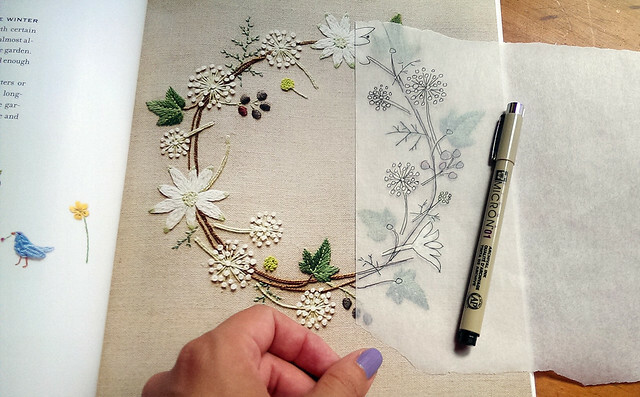 Any thoughts on the tracing paper or Pearlescent floss? I'm curious if any of you have tried either! 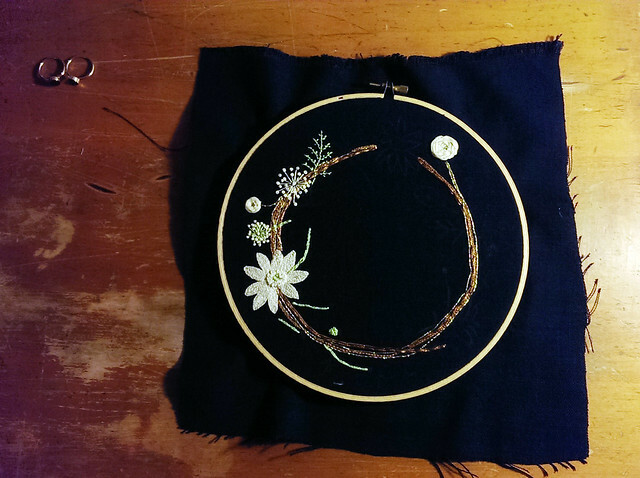 I'm having a great time progressing on this project - I'm embroidering a version of The Winter Wreath from Kazuko Aoki's book, The Embroidered Garden. Up above is a closeup of one of the large white flowers. 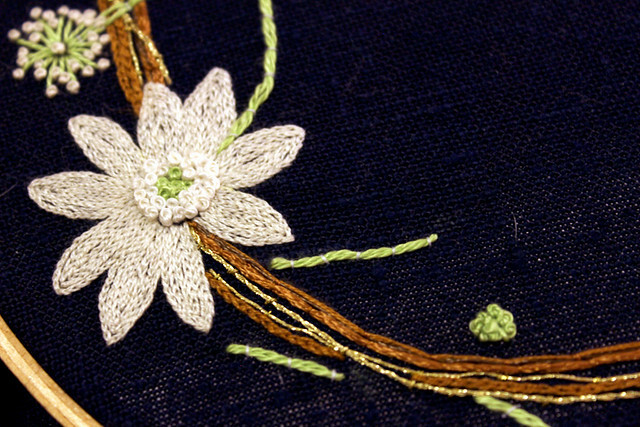 It's all done in split stitch, which is very-time consuming, but I do like the texture. 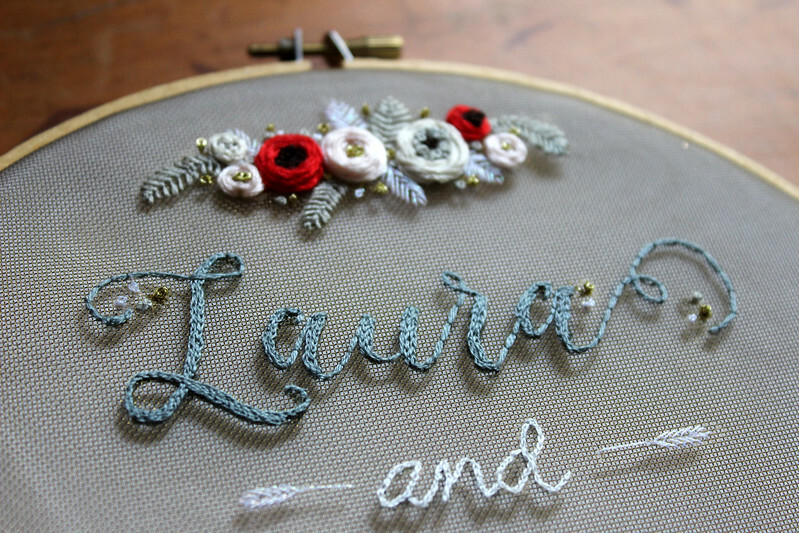 Oh, and tons of little french knots in the center. 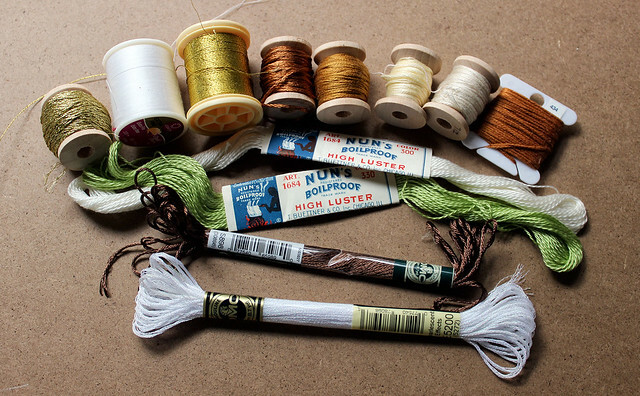 The stems are two strands of vintage Nun's Boilproof floss, couched with a thin white sewing thread. 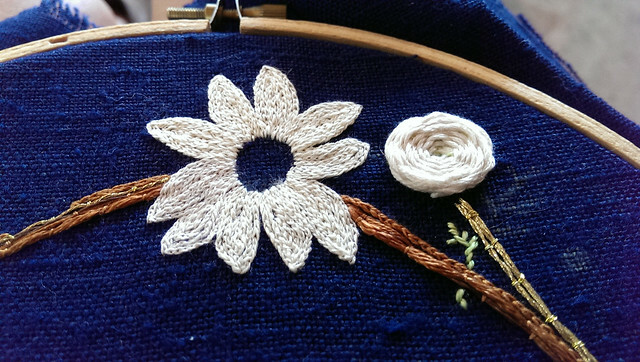 Another large white flower and a large woven wheel rose. 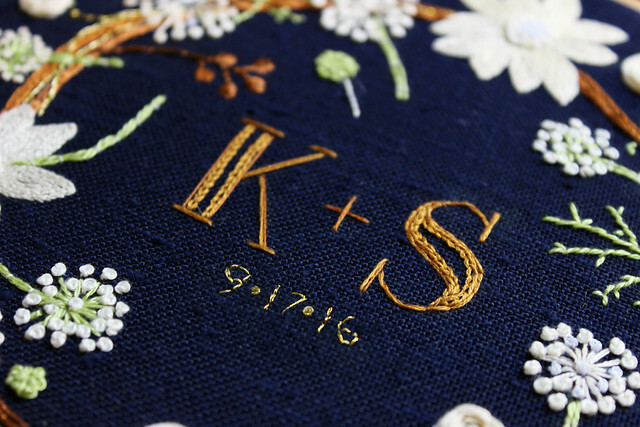 The rose stems are couched gold DMC embroidery floss. 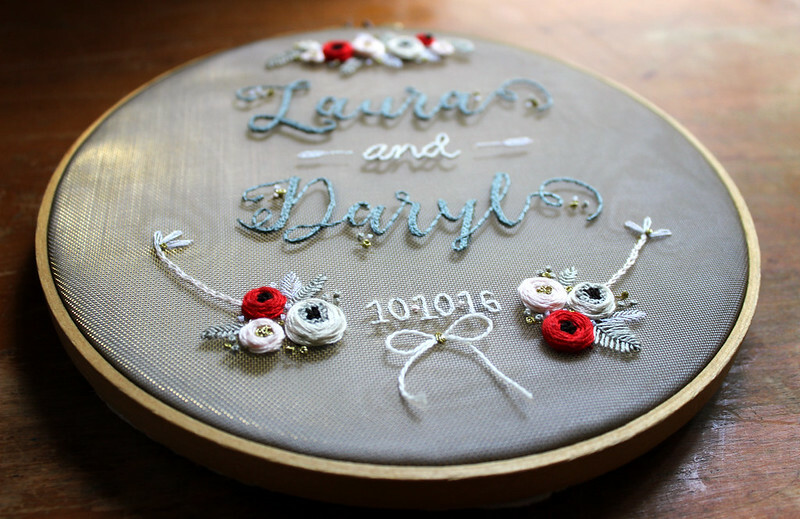 I took this project outside and was delighted by how much better it looks in the light - it really captures the detail more. I opened an Instagram account of my own this week - follow me @nyfloresita if you like! 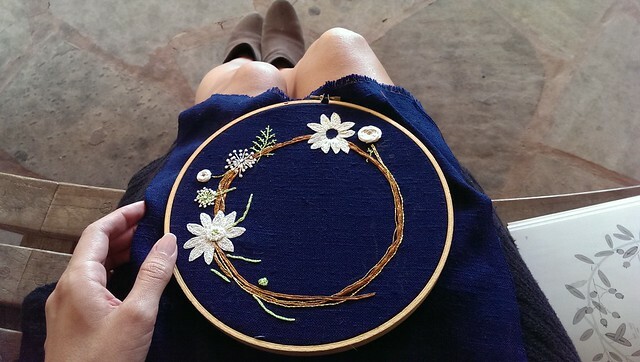 I also post on the Feeling Stitchy account to promote Feeling Stitchy blog posts, and Amy posts on Fridays. 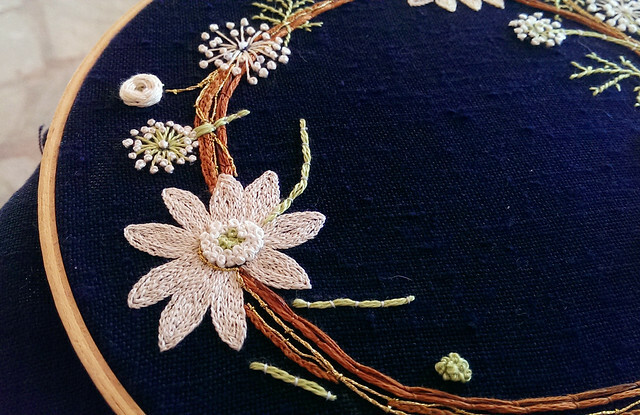 There's such a wonderful community of stitchers on Instagram, and Flickr has really slowed down in terms of finding new stitching online. For now, I'll be maintaining both accounts, and we'll see what the future will bring! 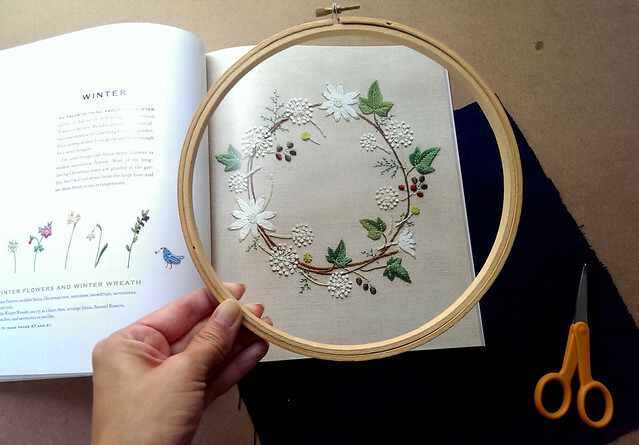 I've been remiss in doing a book review for Feeling Stitchy for a gorgeous book by Kazuko Aoki, The Embroidered Garden. 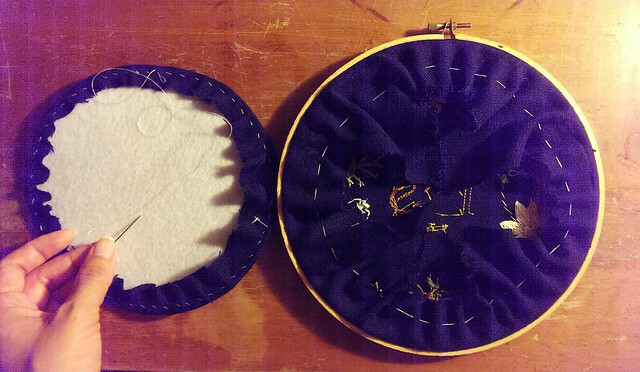 I received the book some time ago from the publisher, and I finally got to work this weekend, gathering materials, and doing some planning and stitching. 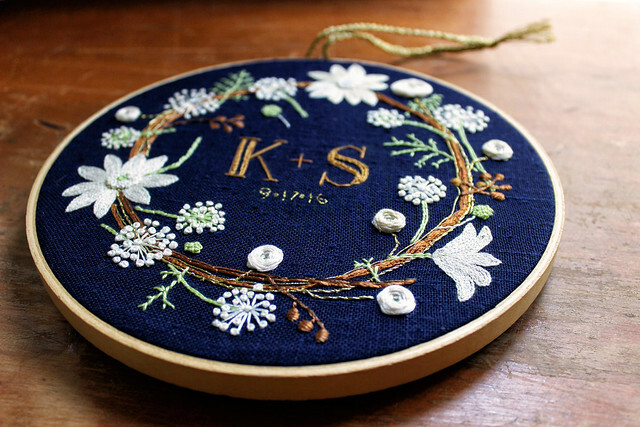 I chose the "Winter" wreath, which I intend to interpret freely, choosing my own fabrics and threads. 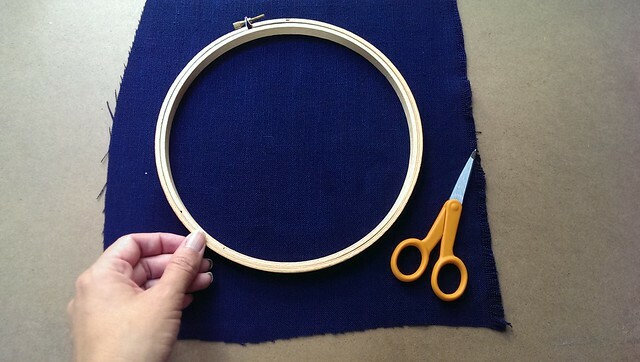 My first step was choosing a fabric - and I was delighted to find a beautiful navy blue linen in my mother's fabric stash. 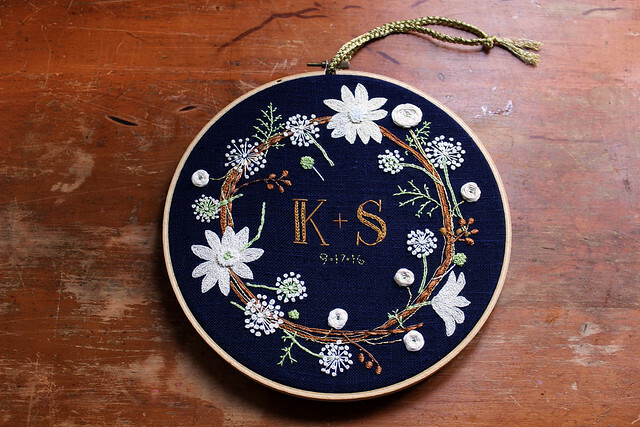 I loved the idea of a strong contrast with the white flowers. I traced the image directly from the photo in the book. 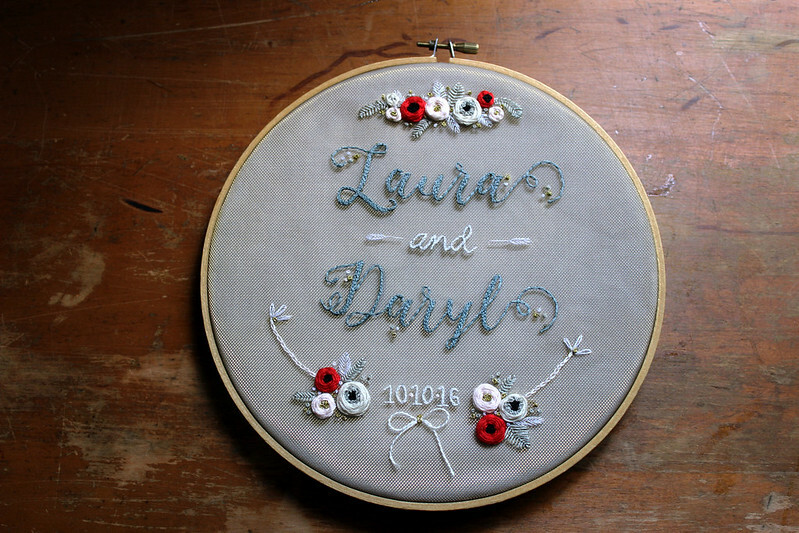 I didn't focus on details, but just a general idea, and replaced the large green ivy leaves with circles for white roses. Once I had my finished design, I used white carbon paper to transfer the image. The resulting image was very faint, so I traced over the white lines in a yellow Clover chalk pencil. 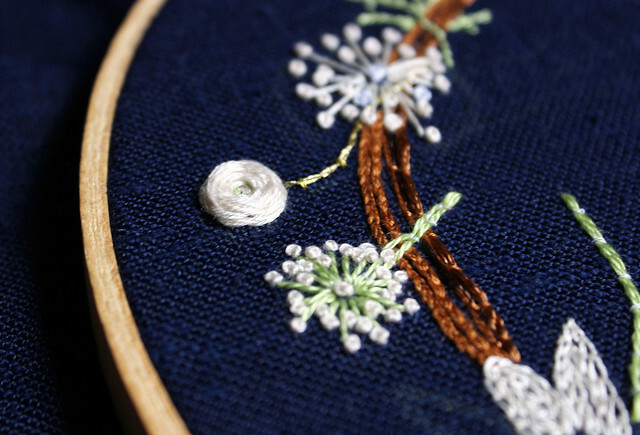 I first stitched the branches with a combination of regular DMC floss, and couched lines of rayon floss, which gave the branches a really pretty sheen in the light. 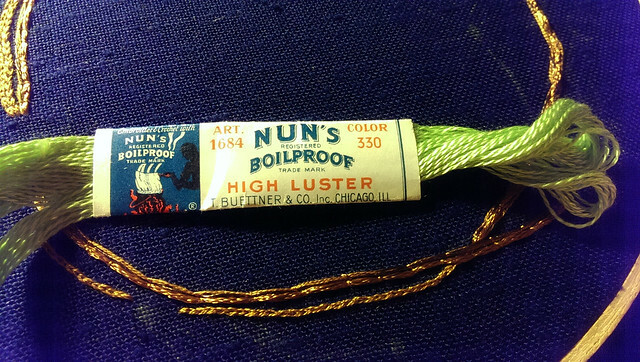 I was fascinated by the two Nun's Boilproof skeins I had - they look like a very thin perle cotton, but are SO very soft to the touch. They piqued my curiosity and I found this blog post about them. 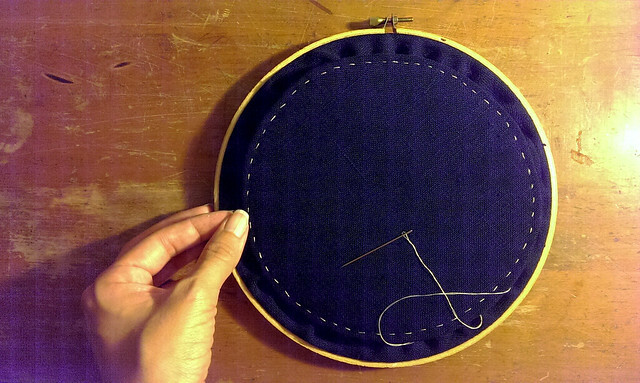 Here it was after at least 12 hours of stitching. 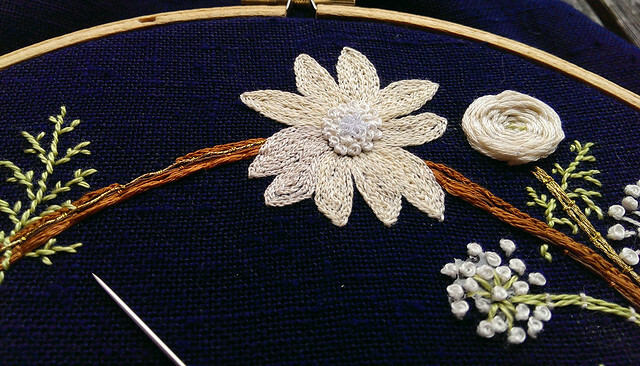 The filling for the large white flower was the most time-consuming - tiny split stitch, using 3 strands of floss, but it was worth it - the texture is so nice! 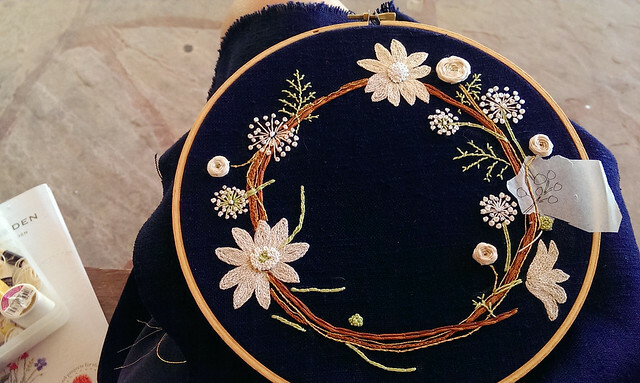 Next, I added french knots to the center of the large white flower, a large white rose, gold stems for the roses, and couched gold strands throughout the branches. 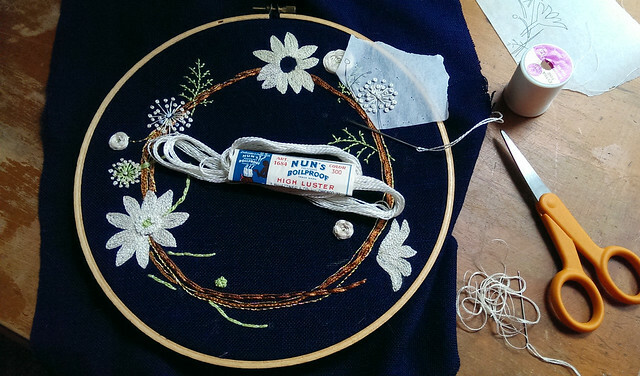 This project was slow to start, and a little intimidating, but I am enjoying it so far! What do you think?